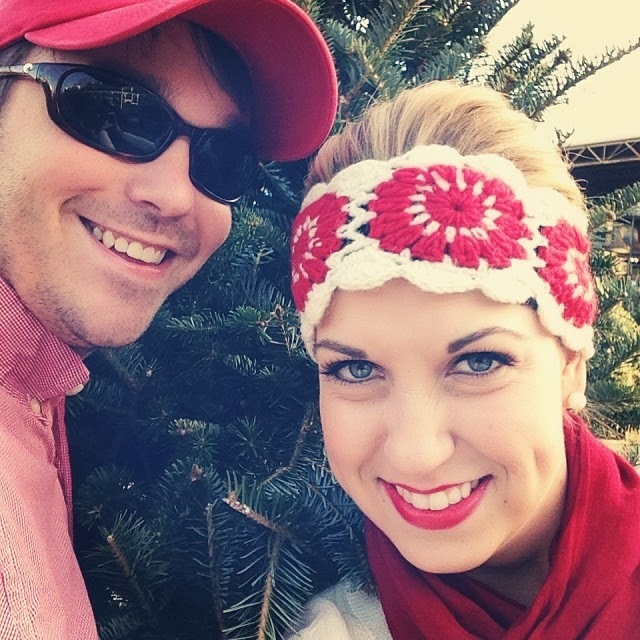 Oh my goodness y'all- I cannot believe it is already the middle of December! I feel like this month has just flown by so fast. Christmas is my favorite holiday, so December is definitely a month that I look forward to. 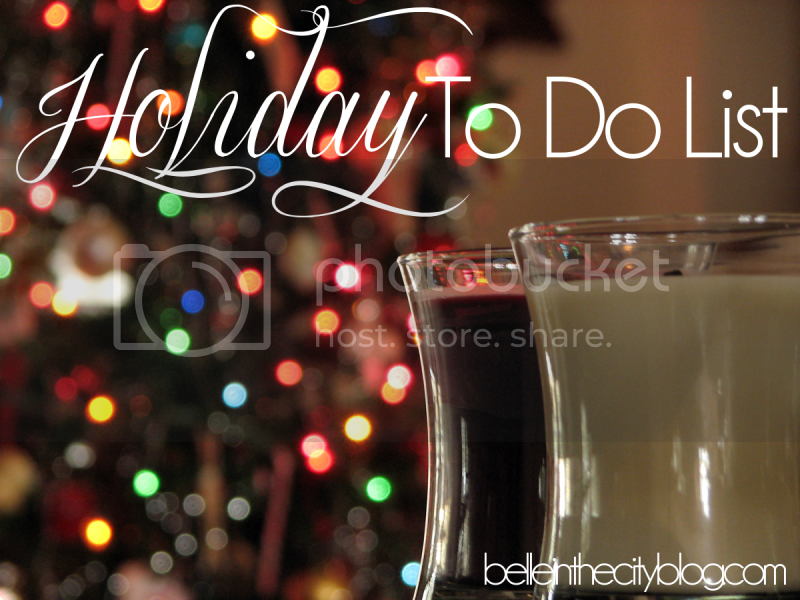 I started thinking about all of my favorite things to do during December..a holiday "to do list" per-say. Of course, not just any tree will do! It has to be tall but not too tall, and full enough but not overly big. This year we went to four (you read that right) different places before finding "the tree". But we found one, and we knew it was the perfect one as soon as we saw it. 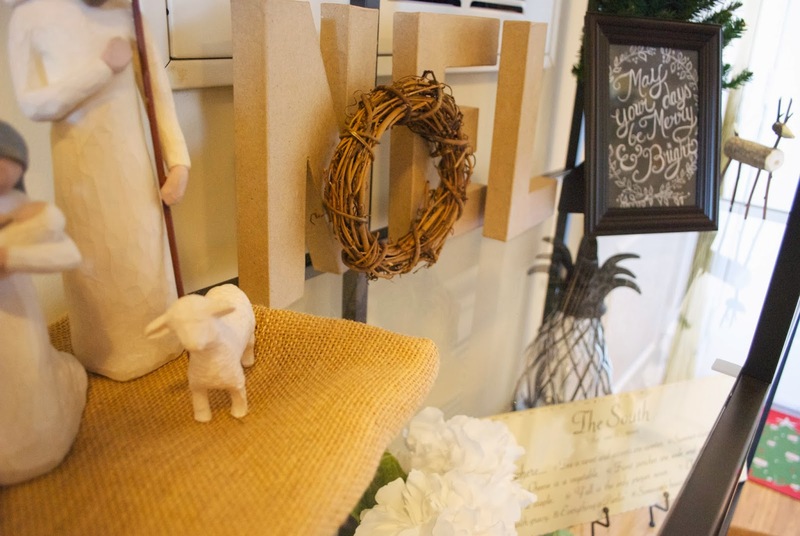 I love decorating, especially at Christmas time..everything is just so bright and beautiful. Over the years I've collected so many neat pieces and it is always fun to unpack the Christmas decorations and find those things that you had forgotten about since last year (this happens every year to me and I always end up giddily saying "ohhh I forgot about this!!!) I can't wait for us to have a house so we can go all out with multiple trees and outdoor lights (think griswold style). I didn't go out for Black Friday this year, but I definitely made up for it online shopping! So many stores had great deals leading up to Black Friday and the week following, that I got a lot of my shopping done then! But there is nothing better than the hustle and bustle of the mall at Christmas Time..everyone looking for the "perfect gift" while Christmas music playing in the background. Some people love to cook, I love to bake! There are so many yummy holiday recipes I've tried and make each year. This is one of my favorite recipes, but each year I always end up making these yummy pretzel/kisses bites..so easy and fun! Between work, family and friends we have so many parties to go to this year and I love it! I always enjoy getting to dress festively and spend time with friends and family. There is just something magical about people welcoming you into their homes at Christmas time. I love all of the decorations and everyone is always in such a holly, jolly mood! Raleigh is a huge city so there is no lack of decorated houses at Christmas time. Some of my favorite neighborhoods to drive through are Oakwood, Cameron Village and Country Club Hills. I just love to see how people decorate their homes. 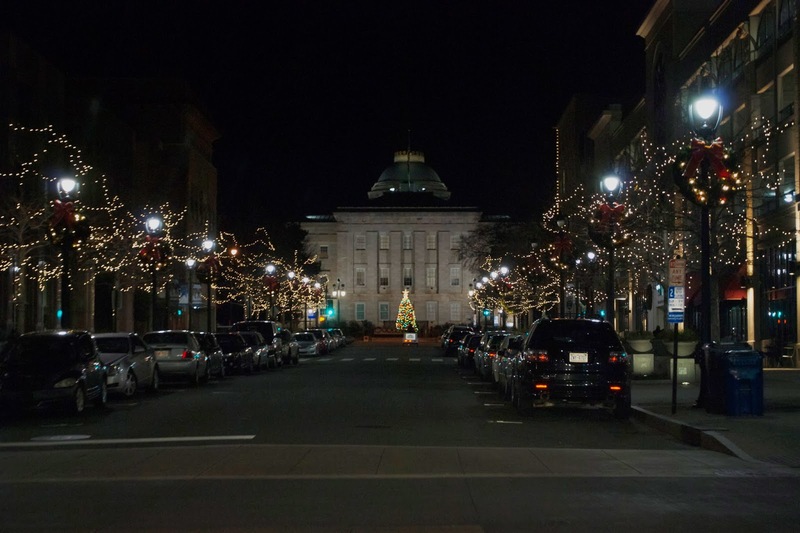 Driving through downtown Raleigh is also one of my favorites, I love the city streets lined with wreaths and Christmas lights. What is on your "holiday to do list"? Do y'all love doing some of these things too? I love unwrapping the ornaments each year too! I try and get a couple of special ones throughout the year so we can remember special trips/moments. If you're ever out in the Crossroads/Cary area, there is a house nearby on the corner of Penny Rd & Huntingwood Dr that has a house/yard FULL of amazing Christmas lights and sets. Worth a drive-by before Christmas is over! I love christmas movies too!! And I love watch them over and over again!! Hummm I have to bake those cookies!! Yummi! Have a great week full of Christmas preparation! I absolutely love this! My holiday to do list is making tons of cookies, decorating the entire house, wrapping and picking out the perfect gifts, and driving around town looking at the gorgeous lights. I love this list. I am so excited to wrap presents and watch Christmas movies..I just need to find the time! I love this idea! Such good things to do as well. Happy holidays!! xo. seeing the lights is always my favorite..can't wait to do that at home! I've been enjoying all the Christmas window decorations here in NYC in the meantime! I love all your holiday photos, they are all so festive!